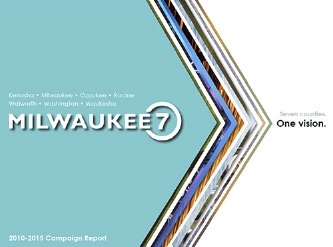 The Milwaukee 7, launched in 2005, was formed to create a regional, cooperative economic development platform for the seven counties of southeastern Wisconsin: Kenosha, Milwaukee, Ozaukee, Racine, Walworth, Washington and Waukesha. Its mission is to attract, retain and grow diverse businesses and talent. Together, these seven counties have a wealth of corporate headquarters, a pool of highly skilled workers and world-class amenities. Competing as a region broadens our range of choices and opportunities and gives us the competitive edge that we need, today, and into the future. The Milwaukee 7 builds capacity for economic growth through its initiatives, strategies, networking and partnerships. The Milwaukee 7 continues to build the region’s capacity and accelerate economic growth. In the last five years, M7 has assisted companies that created or retained more than 7,000 pledged jobs in the region – with an average wage of $49,088 (9% above the regional average) – and produced $653 million in capital investment.